Somewhere along life’s path, we are instructed: “You get just one chance to make a first impression.” Saturday afternoon, I got one of those chances. A gentleman had driven up from Florida for an interview. He was interested in a North Carolina opportunity in our company. From our initial handshake to casual conversation over sandwiches of smoked brisket and pulled pork barbecue, I was encouraged. My guest, Gary, was making a good first impression. I liked his skill set, track record and passion for community journalism. But most of all, I was impressed by his relaxed and self-assured demeanor. It was obvious that he knew plenty about our craft, and I sensed he would be a good fit anywhere within our organization. When our meal was finished, I wanted him to learn more about us. It’s just as important for prospective associates to know as much about us as we know about them. And on a humid, dog-day afternoon, what better place to continue our talk than the air-conditioned office of The Press-Sentinel? As for making the hoped-for positive first impression, I figured, “So far, so good.” We kept walking. Turning the corner into the mail room, we spotted Marcelle Yeomans, who was pulling tearsheets. All jobs at the newspaper are important, but this assignment is a key to providing proof to the advertisers that their ad ran as scheduled. Customers paying their bills keep our presses rolling. No one is more dependable or pleasant than Marcelle. After exchanging greetings with our guest, her eyes widened. “We have a rat—a really big rat—in the building,” she said. “Really, where?” I asked. She pointed to the graphics department. I thanked Marcelle and promised to do something about the intruder. When Gary and I started toward the conference room, I skidded to a halt. Hunkered down by the supply-closet door was that “really big rat.” The critter looked at me. I looked at Gary and said, “Wait right here.” I retreated to the press room, looking for something—anything. Snatching up a small roll of unused newsprint, I returned to the hallway. Gladiator-like, I hurled my 10-pound blunt spear at the long-tailed rascal. 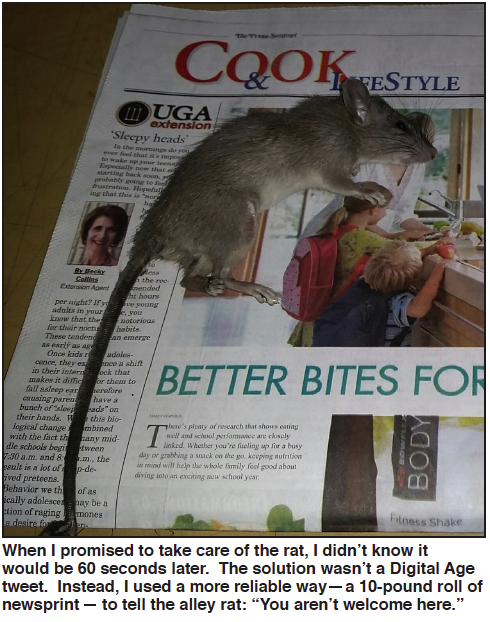 The battered rat scampered into the men’s room, behind the trash can. With a swift kick from my size-12 Merrell to the plastic can, I penned the rat to the baseboard. “That should do it,” I mumbled. But when I pulled back the can, nope. The rodent skittered for the door. Splat. His retreat was cut short. My aim had improved. Looking up, I realized Gary, who had never met me before, was watching. “Uh-oh,” I thought, “so much for a good first impression.” Grabbing a broom and a dustpan, I collected the dead rat, while wondering how to put a positive ending on this unexpected episode.